I bought 6 succulent plants from B&Q, and need to know if they're cacti or some other succulent, so I know if they're safe around my cat. After hours online I've managed to identify 3 of them, but need help with the other 3. They're all in 5.5 cm pots... Other than that I think the pics describe them much better than I can! Very grateful for any help. Hi Victoria, one mouthful of all the prickles, and I would be surprised if the kitty came back for more! These are all cacti of some type, and I'm so sorry, they are not my field of expertise. There are many that are sold in box stores and garden shops, mostly Mammalaria, Parodia (also still found in the trade by their old name of Notocactus) and Rebutia. Mammalaria is known by the common names of Powder Puff, Snowball, Golden Star, Lady Fingers and many others. They are one of the most commonly grown genus, as they're easy to care for, and will successfully bloom every year if they're given the right care; the flowers emerge in a circular 'crown'. Keep plants cooler in winter than in summer, and dry winter conditions will help set the buds. Parodia goes by the names of Ball Cactus, Silver Ball, Yellow Tower and Tom Thumb Cactus. Round shaped and ribbed, these often show symmetrically arranged showy spines. Rebutia can be called by several common names: Crown Cactus, Cluster Cactus and Red Crown, all descriptive names to help identify which particular species you have. 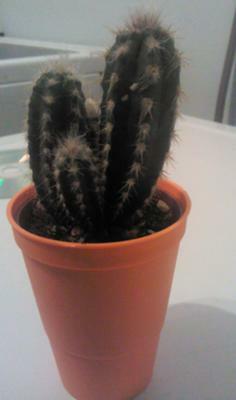 Most cacti prefer to be dry rather than wet, so if in doubt, don't water. Moderate temperatures (no scalding hot sun shining directly on them through a window or frost) and well drained soil with excellent drainage will keep them happy. Thanks so much for your speedy and comprehensive reply! Believe it or not, my cat has tried to take a bite of these several times, and although the spines have put him off each time, after one of the three I managed to identify myself turned out to be an aloe of some kind (toxic to cats), rather than a cactus, I didn't want to take any chances. The aloe is now living in my workplace, and now I'll be able to enjoy all the others at home without worrying about harming my furry friend!